Field and I (Mary) were both born locally in Chester County PA. We attended Kimberton Waldorf School, which is where we first met in Kindergarten ( when my older sister shared a cubby with my future husband!). The Waldorf School is where we were both first introduced to farming and the importance of organic, sustainable, and nourishing foods. A major component to our relationship has always been our commitment to local, organic, sustainably raised foods. We purchase the majority of our food from our local health food store Kimberton Whole Foods. We have been members of the Sankanac CSA for the past 6 years and have taken immense joy in finding creative ways to use and store all the wonderful produce we get each season. We have bought some large shares of meat form local farmers through the years and this slowly encouraged our interested in attempting to raise our own meat. We started by raising some broiler chickens with friends and raising our own meat was a truly amazing experience. Knowing exactly how the meat was raised, knowing the animals were treated in the best possible way, allowed to roam on pasture in a healthy environment was incredible. We currently have two beautiful daughters, Clara and Ava. 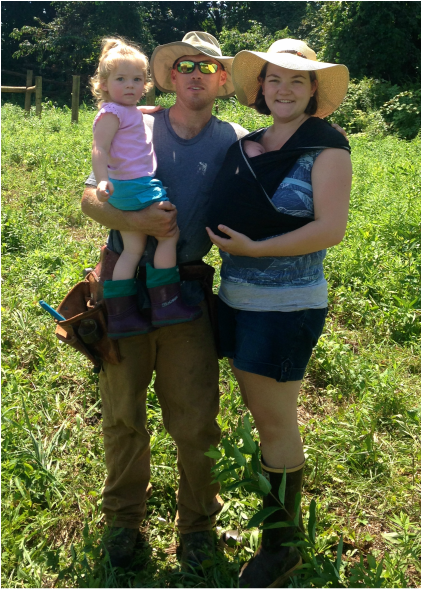 Our growing family is what inspired us to become even more dedicated to raising our own food. Not only do we want to provide wholesome safe meat for our children to eat, we also want them to be connected to where their food comes from. Buying prepackaged meat that bares no resemblance to the animal it came from allows the consumer to completely detach themselves from the fact they are eating something that used to live and breath. This detachment is what has allowed our culture to distance themselves from the truly deplorable conditions many factory farmed animals are kept in. It is important to us our children never take their food for granted and that they learn to respect and care for the animal that the meat came from. So this is the heart of our business, creating a product that nourishes our family’s body and spirit as well and something we are proud to share with our community. While Field, Clara, Ava and I are the nuclear family behind Snouts and Sprouts, we would never be able to accomplish our farming goals without the help of our extended Family. My father (a.k.a Grandpa) has been a huge technical help to Field. He has also become our primary Mower!. Anyone with large fields to care for will tell you mowing is endlessly needed and incredibly important when rehabilitating pastures! My Siblings (especially my brother mike) have put many hot hours in helping with the construction of our chicken and turkey tractors, pig feeders and waters and the fencing of the pigs! My mother (a.k.a. Grammy) has spent hours watching and entertaining Clara while we worked on the farm! We could never have gotten everything squared away without their help and moral support. They have truly made this a Family Farm!